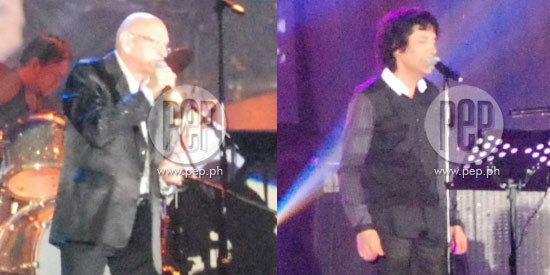 John Claude Gummoe (left) of The Cascades and Kyle Vincent serenaded Filipinos during their May 14 concert at the Solaire Resort and Casino. Last May 14, the Cascades and the Classics IV serenaded lovers of ‘60s music during a special one-night only concert presented by Steve O’Neal Productions and Solaire Resort & Casino. The front act featured the talented local quartet of Mark Mabasa (a finalist of The X Factor Philippines Season 1), Lilibeth “Beth” Garcia (3rd in the Women's series in the 2012 Karaoke World Championships), Lucky Robles (Unang Hirit Morning Star) and John Vincent “JV” Decena (2012 KWC Philippines representative in the 2012 Karaoke World Championships) performing “After The Love Has Gone” (A 1979 Earth, Wind & Fire hit single) and “Nobody’s Gonna Stop Us Now” (A Starship hit). Mark also did a solo rendition of “A Song For You,” a 1972 Carpenters’ hit. The Classics IV, next on the ballroom stage, is an American band formed in 1965 that is given credit for beginning the "soft southern rock" sound. This was their first visit to the country and they regaled the Filipino audience with their hits (released from 1967 to 1969) “Stormy,” “Traces” (their highest charting hit, reaching No. 2 in 1969) and “Spooky,” which have become cover standards, as well as “Every Day With You Girl,” “Change of Heart” (1970) and “Unchained My Heart,” a 1987 Joe Cocker hit. Another special guest performer and three-time Philippine visitor was Hollywood singing sensation Kyle Vincent, who used to front act for Barry Manilow (and was managed by Manilow’s people). A Filipino crowd favorite, he first sang Carole King’s “It’s Too Late,” then mingled with the audience while singing “I Like Dreamin’” (a 1977 Kenny Nolan hit) before performing, on keyboard, his own composition “Let Me Let Go.” Amazingly, he also sang a Tagalog song, “Hanggan,” a Wency Cornejo original. The final hour of this two-hour concert was reserved for the main act: John Claude Gummoe, the founding member, lead vocalist and songwriter of the hit 1960s group The Cascades. Interestingly, the Cascades—rumored to have met their untimely demise in a plane crash in the late 1960s—is actually alive and well. In fact, the American vocal group already performed in the Philippines in 2005. During the May 14 concert, John was accompanied on stage by second generation members Gabe Lapano and Tony Grasso. They were also joined by musical director Chuck Crews and a fantastic group of Filipino musicians (including keyboardist and official member Carlo Gaa) and 3 Filipino back-up singers who have been working with John for about three to four years. John, who calls Jose Mari Chan “a genius,” also sang Chan’s (who was among the audience that evening) signature OPM hit “Beautiful Girl.” John, also a big fan of the Everly Brothers, also did a tribute to this iconic singing duo (whose other half, Phil Everly, died last January 3) where every backup singer sang a duet with John, harmonizing the Everly Brothers’ hits “All I Have To Do is Dream,” “Devoted to You” and “I’ll Do My Crying in the Rain.” He also sang a duet with Kyle, rendering “I Bless the Day I Found You.” Two of the Filipino backup singers also enthralled the audience when they belted out “The Prayer,” a popular David Foster song. Also during the show, John also did a sing-a-long with the audience, one of his favorite parts of any of his shows, belting out the Peter, Paul and Mary hit “Puff the Magic Dragon” and the Sound of Music staple “Do Re Mi,” among others, which the audience loved. 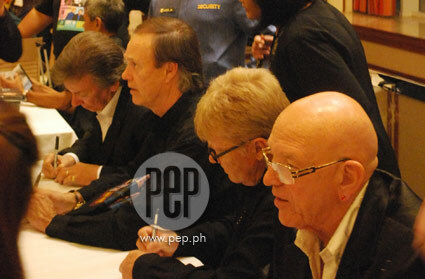 After the show, John, Kyle Vincent and members of the Classics IV, autographed CDs of their respective song albums. John signed copies of his latest CD called 50th Anniversary Rhythm of the Rain, which includes 3 versions of “Rhythm of the Rain” among other new compositions.